Honda CR-Z Pros and Cons | Page 1 of 1 | Why Not This Car? What drives people to buy (or not buy) a certain car? TrueDelta's members share Honda CR-Z pros and cons based on their real-world driving experiences. 2014 CR-Z is great choice for fun and fuel economy. A compormise car that is not really a great hybrid or sports car, but overall we love it. We live an a smaller urban environment so traffic is not an issue for us. My wife and like sporty manual transmission cars. This is her daily driver. The exterior styling is exceptional and unique. The car looks mildly exotic, with well placed curves, accents, and smooth lines. It is very different from traditional styles. 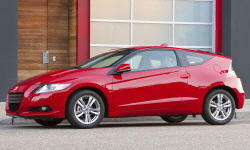 The visual impression is that the CR-Z is a well-designed fun and capable car.